A right-hander barrel which picks up mega swell. Short hollow right-hander, has quite a steep takeoff, barrelling towards the channel. Point break right-hander with a tendency to have a long workable wall. Offers lots of opportunity for cutbacks. Hollow lefthander that barrels on takeoff, offering a short but sweet ride. Great for big swell days. Smaller wave that is great for less experienced surfers, can break left or right with the right side more consistent. A big hollow left-hander that can be very shallow at low tides. Lifts from a small section of reef to barrel into the channel. 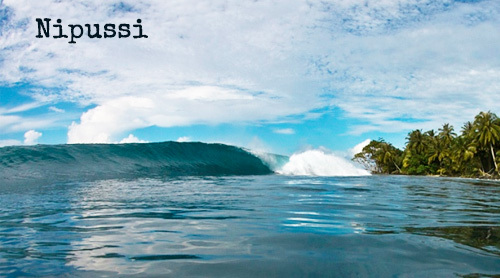 A perfect right-hander that is one of the most recognisable waves in all of the Mentawai’s. This is a fantastic right-hand barrel which can sometimes get quite hairy down on the inside section. Left-hander perfect for (unusual) smaller swell, great fun waves. Long left walls can have barrel sections down the line. Fun wave. One of the best waves on the planet – Macaronis is not for the faint hearted. Very hollow lefthander offering workable walls and long barrel rides. Nice right-hander short but sweet ride, Quite deep water so no worries about reef cuts, quite a consistent wave. Long barrelling lefthander, quite sectiony, best on a larger swell. Right-hander that is fun for airs and all the tricks. Heavy left-hander that holds big swells. Big board recommended and be prepared for the occasional hold down. Good right-hander similar to HT’s. Be ready to get barrelled. 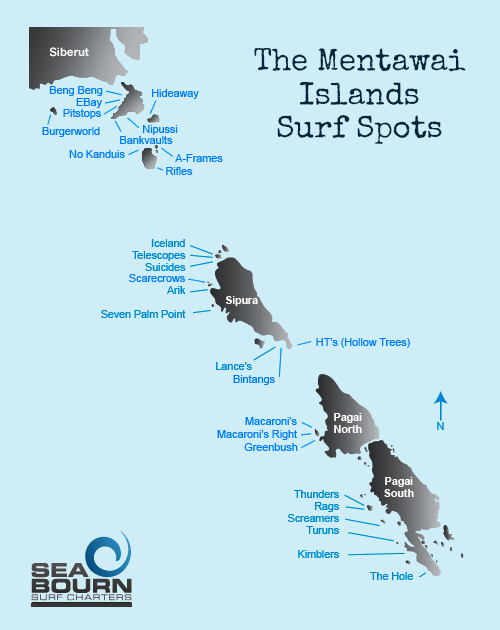 Known as one of the most perfect right-hander waves in the Mentawai’s. The bigger it gets the longer the barrel section. Expect long rides deep in hollow barrels. Left-hander can have some good fun sections, with some wedgy sections. Best on the lower tides. Left-hander peeling off the reef, can get heavy when its shallow on the inside with big swells. Starts barrelling straight from the takeoff point, this left-hander can be quite impressive in a big swell. Hold your line or it could be a bit gnarly. Big left-hander likes a bigger swell, workable sections with the odd barrel on offer.